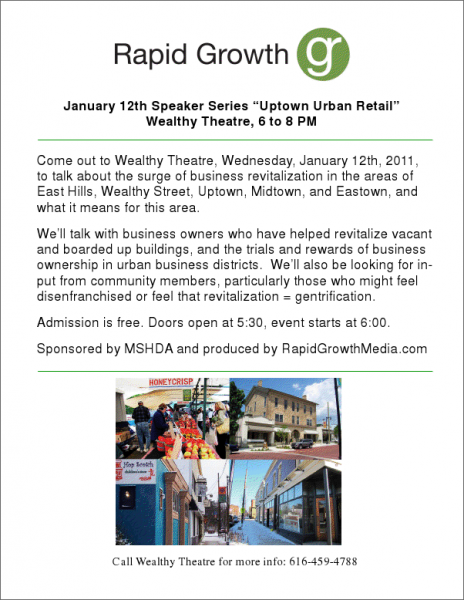 Local online publication Rapid Growth Media has revised its much anticipated “Not Your Average Speaker Series: Uptown Urban Revitalization” event, a public discussion on the changing environment in several of Grand Rapids’ southeast business districts. 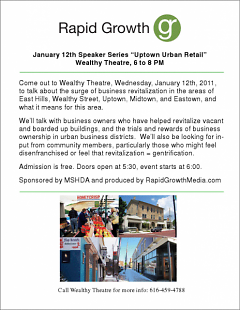 The event will be held at 6 p.m. tomorrow evening at Wealthy Theatre (1130 Wealthy St. SE), a historic theater in the Uptown area. Rapid Growth, which publishes news and feature articles about the local business and development community on a weekly basis, has hosted at least 11 panel discussions in as many months. This one, however, will be slightly different. Though originally billed as a panel discussion about “Uptown Urban Retail,” marketing for the event changed in tenor after several Uptown businesses were vandalized on Christmas morning. After the initial story broke, there was some clamor for a “real-life” community forum to address issues raised in online discussion following the acts of vandalism. This sentiment was echoed in other online platforms, most passionately in the comments of Grand Rapids Institute for Information Democracy (GRIID), an online publication that provides local media analysis. In light of this public interest in a moderated discussion, the format of the event has changed. There will be no panel. Instead, the evening will be dedicated to public comment. Topics will focus on both the positive and negative qualities of neighborhood development. "Normally [with these panel discussions], we tend to focus on the pro-business, pro-growth side of the discussion," said Rapid Growth's local publisher, Jeff Hill. "But we thought that in light of things that have gone on lately, the sensitivity around the events of December 25th, and the discussions that followed it, we wanted to hear both sides of the discussion. Rather than having a panel of just business owners, and having just that side of the story, we thought we would be more neutral and open it up to the audience. We expect that there will be many people in the audience who can talk about Uptown." In the GRIID comment thread, both Hill and Rapid Growth's managing editor J. Bennett-Rylah offered public invitations to the event, encouraging anyone wishing to discuss these issues in person to do so there. Rapid Growth staff reinforced the invitation by producing a flyer for broad distribution around Uptown’s residential neighborhoods, hoping to encourage a diversity of voices. "Feelings about gentrification" - what can business and neighborhood communities do to help the area retain its diversity? The event is set to begin at 6 p.m. tomorrow, with doors opening at 5:30 p.m. More information can be found at Rapid Growth’s Facebook event page. Great idea for a speaker series. Good work!